Founder of the DJ collective Nana Chill (Started in 2002) with partner, DJ Dayta. The group organized events in their hometowns of NYC & Houston, playing weekly DJ sets of House, Hip-Hop and Breaks. In 2006 Morsy would go on to join forces with New York City based DJ / Promoter, Chris Lehault aka DJ Kester. The two combined were known as Crooked Disco, throwing monthly events all over Brooklyn and Manhattan. With support from their local press at Time Out Magazine, The L and The Village Voice, Crooked Disco would go on to create some of the best parties NYC has ever seen. In addition to organizing events, Morsy spent countless hours in his music studio. Famous for the "Emo-Thug" mash-up series, he would get his first taste at traveling the world and playing to large European crowds in Switzerland, Austria, Czech Republic and the Netherlands. Several years later, Morsy signed with DJ talent agency Scratch Music Group; where he began his venture into the corporate DJ world, working with such clients as Esquire, H&M, Saks, The Westin, AXE and Royal Caribbean Cruise. During his monthly visits on the cruise lines, Morsy would earn his way up DJing the worlds largest cruise ship, Allure of the seas; traveling throughout the Caribbean Islands. Presently, Morsy has put prime focus on his music releases, and collaborating with producers and vocalists all around the world. Be sure to check out his releasees with famed record labels such as Nervous Records, Moody Recordings, Top Billin, Jango Music & Clover Records. When a 12 year old runs for class president with the sole intention of being able to book the talent at schooldances And subsequently buying the necessary equipment to DJ Himself, DJ MopTop was born. Currently residing in New York, DJ MopTop travels throughout the United States performing alongside the likes of Diplo, Common, Chromeo, CRNKN and AC Slater and with numerous corporate clients including, H&M, Diesel, Victoria’s Secret and Details Magazine. Growing up DJ MopTop was influenced by Jimmy Hendricks, Jay Z and A-Trak, and at the age of 18, DJ MopTop was able to find his unique sound and gain multiple residencies and founding the group Starters and Pelle Pelle. Soon after that, he was featured in URB Magazine’s next 100(0), Frank151 Magazine, UR Chicago, Chicago Reader and NY Magazine and performed at the Vice stage at SXSW, the W Hotel in Time Square during New Years Eve, Webster Hall, GOLD BAR, (le) poisson rouge in New York, Butter in North Carolina, Sound garden in Philly, MJQ in Atlanta and Decibel in Milwaukee. Leaving Chicago at age 22 to expand his network and further develop his style, DJ MOPTOP moved to New York and immediately gained a residency at some of the top clubs in the city and Brooklyn all while landing a coveted residency with H&M. With an evolving stage show of breaking down the genre barriers; fusing Old School Hip-Hop with Deep House, Rock WIth Main-stream Pop, or Disco with Soul, DJ MOPTOP is poised to push a distinct underground style into the mainstream. TR!CK$ is a fresh artist from New Jersey’s club music scene who is bringing Jersey Club to the masses. He stands out from the crowd with his unique sounds using driving, Jersey Club beats to seamlessly marry hip- hop and EDM. TR!CK$ has been featured on Mixpak and BBC Radio 1xtra and has garnered support from artists such as Cashmere Cat, Sliink, Trippy Turtle, R3LL, Nadus, and Hoodboi, not to mention that he’s now a part of the renowned Brick Bandits crew. PRESTIGE is a dynamic rapper, singer/songwriter from Dover, Delaware. His charismatic style contributes to his unique sound and allows him to evoke emotions when putting life into a track. Being one who recognizes music’s ability to change lives, PRESTIGE strongly believes that the new generation of artists need more individuals who serve as positive examples. As he aims to be that example, PRESTIGE has continued to flourish as a new generation musical powerhouse. Over the last year, PRESTIGE has put in countless hours to create and complete his debut album titled “What A Week.” This highly anticipated project consists of ten tracks and releases March 3, 2017. The concept achieved by this album creatively projects the highs and lows we all experience day to day. “What A Week” is now available on SoundCloud and will be streaming on all platforms sold on iTunes. Originally formed in 2008, the FLOWCITY movement is a ground breaking alternative hip hop band from Dover, Delaware that is ready to move to the head of the class in the new age of rappers, lyricists, and producers and engineers. 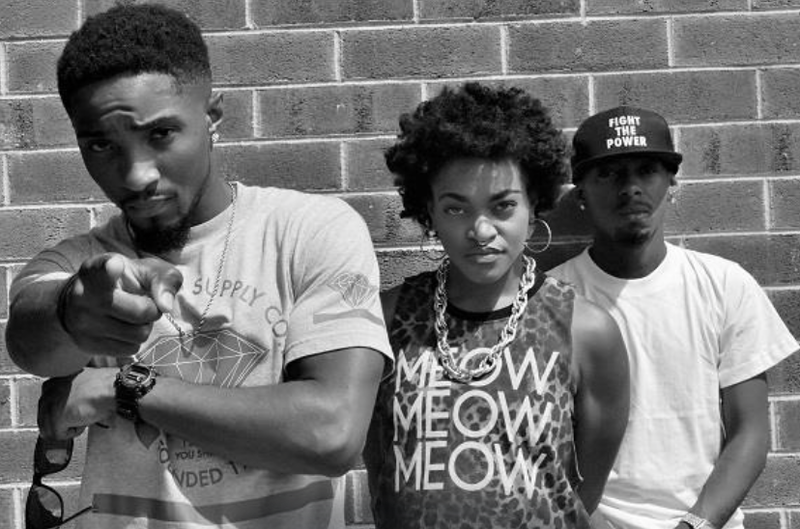 FLOWCITY is Yung Rocko (Darien Williams), Brownie (Danielle Johnson), and Nino Nosay (Dexter Brown). The three artist bring a wide array of fresh sound, great energy, and great vibes to hip-hop music. After teaming up with Dj Elegal, FLOWCITY has been blowing up the stage and making new fans everywhere they perform. FLOWCITY has opened for mainstream artists including: Meek Mill, Travis Porter, Kirko Bangz, Lloyd Banks, Dricky Graham, Bei Major, and Miguel.The FLOWCITY sound will immediately cross demographic lines, racial barriers, and simply put just "feel good music" into the mix. Conceived by brothers Jon and Chris Lijoi on a musical journey through Italy Night of the Living Funk is a balls to the wall post art-deco funk ensemble. Based from an idea tracing back to their teenage roots: tight funk grooves and black and white horror flicks. “We wanted to take the live performance one step further and incorporate a visual stimulant,” explains front man Jon Lijoi of their unique performance wherein they project old horror movies on stage while playing. The idea came about after a rigorous week of rehearsals and gigs with Krantz. Maybe it was the change of scenery, or the bottles of wine(or getting stuck in an elevator with B-Rad) that triggered this newfound project, but it was at their last Italian dinner they agreed to set up jam sessions once they were back in the states. Coming back to New York the brothers quickly assembled a crew of inspired music students to set forth with on this project. After a great deal of playing together the band was no longer just an idea but a group of 11 dudes and dudettes with a mutual love and dedication to funk, soul, and jazz music. Not to mention they had an oversized tapestry (Thanks Casey! ), HD Projector (Thanks Dan! ), and a slew of old school horror flicks at their disposal. A soulful vocalist and mainstay of the New York City circuit, Mariella is a name to watch out for. Her poignant lyrics and masterful song writing have earned her accolades worldwide including being named Billboard World Song writing Contest grand prize winner in 2008, and John Lennon Song writing Contest honorable mention. She is also the co-creator and co-host of one of NYC’s longest running and most critically acclaimed hip-hop jam session, Freestyle Mondays. In addition Freestyle Mondays, she has also held long residencies at various clubs in both New York City and Asia All these experiences have cultivate the sound of her debut EP featuring production by Mark de clive Lowe, Zeb and Sabo, Dj Vadim, and Rouge Pop. From the synth-pop heavy Brooklyn Boogie to Miguel Atwood Ferguson’s lush strings on “Disappoint” her sound is eclectic, rich, and all her own. Mariella’s remix album will further cement her as a dynamic artist and a dance floor favorite with remixes by Mark de Clive Lowe, Rich Medina, JBoogie, Crisis Kid, and DJ Obah. Since the singer-songwriter Raphaello Mazzei had his first guitar lessons at the age of seven, the music began to accompany him. Self-taught, at twelve, he climbed the stage for the first time, certain that it was his place. Since then, integrated bands as a drummer, singer and composed several songs. We had recorded partnerships, such as the single Slow Down (Peter Goetz / Mazzei), produced by Arthur Maia and released in the United States, has performed alongside experienced musicians like Elaine Guedes, Claudio Zoli, Renato Rocketh, Sandra de Sá, Wilson Meireles. His songwriting songs are planned for release soon in the solo debut album, formed by a selection of partnerships with young composers of the scene carioca. As a native New Yorker, Stef Nava’s affection for music began at an early age. While studying the mix tapes of local DJs, reading producer credits and constantly digging for music, it became evident early on that Stef had a mature heart for music and the heart to go with it. However, while she might be an in-demand DJ now, Stef began her career in acting—far from the turntables of NYC’s hottest clubs. She guest starred in shows such as Law and Order,Rescue Me, and can be seen alongside Joe Pesci and Matt Damon in the Robert Deniro directed film “The Good Shepherd,” to name a few. While in between acting jobs, Stef grew and interest in DJing and began collecting vinyl records. While in the midst of growing her passion, a good friend and college radio DJ gave her her old pair of technics. Little did he know that would help set the tone for a booming career in music. Since then, she has been practicing tenaciously and truly sharpening her craft. Her skills and impeccable music selections have landed her gigs at The Strand Hotel, Stash, The W Hotel, The Andaz Hotel and Le Poisson Rouge, among others. Her roster extends to bigger companies and events with clients including The Brooklyn Nets, Saks, Bloomingdales, Macys, Sephora, Anthropologie, Jameson, H&M, Esquire Magazine, Lucky Magazine and Cosmopolitan. Stef may have come from a the silver screen, but she shows no signs of letting up on the 1’s and 2’s.